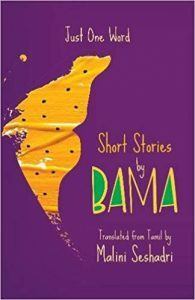 The Tamil Dalit woman writer Bama has been a phenomenal name in the contemporary Dalit literary terrain. Widely celebrated for her life-writing Karukku (which completed its 25th year of publication in December 2017), her recently published book Just One Word, a compilation of fifteen short stories translated from Tamil into English by Malini Seshadri heralds a new chapter in her literary life. Written between 2003 and 2015, the stories ferry the readers into the quotidian travails yet spirited lives of the rural folks, the schools as well as urban settings, each of them building upon themes such as (evolving) caste practices, patriarchy, pedagogy and social evils like female foeticide. Stories like ‘The Grazing Fields’ and ‘This Man’ dwell upon the village folks whose lives are laced with an element of fatalism, with equal measures of tears and laughter, rice gruels and lively gimmicks. While the village life offers them very little in terms of opportunities or upward mobility, they embrace it upfront, weather it and enliven it to the maximum limit possible. Another major setting in the stories is the school, a ‘modern’ space where young minds are supposed to comingle unencumbered. Yet this ‘modern’ space of learning (and unlearning), far from being alien to caste is in fact adapted to caste practices and untouchability. The narrator indicts both teachers and family as an institution for fostering caste in classrooms and drilling it deliberately into young minds. So for example the ‘upper caste’ schoolchildren are indoctrinated at home not to drink water from the cheri (Dalit neighbourhood) taps or interact with the cheri children, the headmaster instructs them that they could drink from the ‘cheri taps’ but should refrain from drinking in ‘cheri homes’ (p. 16). Likewise a teacher gives a lesson to her class on a poem (which negates the validity of caste and urges for a social revolution), she herself practices caste blatantly with her Dalit colleague. The narrator acerbically projects the pedagogic practices in a critical light and suggests an alternative way in which the malleable minds are invited to actively join in the (un)learning process. Being a teacher herself, the author brings in first-hand experience and insights and infuses them artistically in these stories. Obnoxious practices of caste and untouchability are generally (mis)taken to be caught and confined in the antiquity of the traditional village milieus. But these stories give us some fresh jolts as to how caste practices and untouchability have been slowly mutating and manifesting in varied forms in urban social milieus. This ‘evolved’ form of discrimination, while playing upon age-old prejudices, uses its own paraphernalia of registers. So for example a ‘caste name’ (derogatorily used in traditional social milieu) is replaced by a bureaucratic register like ‘SC or ‘that’ person in reference to an ‘ex-untouchable’ who is thought to be lacking in ‘IQ’ (intelligence quotient) and banking on ‘RQ’ (reservation quota) for mobility (p. 71) while ‘upper castes’ or ‘FC’ (apparently forward caste) are ipso facto credited with high IQ. The titular story ‘Just One Word’ explores this in detail. In another story ‘Corpse’, in a relatively posh urban colony occupied by people of different castes and religions, a Dalit family, in spite of having middle class attributes and affluence is deliberately not invited to a marriage ceremony (a social gathering) in the colony owing to its caste identity. In another similar story dotted with autobiographical vignettes, no one would take the narrator as tenant because of her caste and single working woman status. Hence, the ascribed social identity outweighs and takes precedence over the hard won material (upward) mobility and continues to mete out discrimination against Dalits. Tinged with a barely concealed irony, the author employs the allegory of birds and animals in these stories so as to render visible the bonhomie and conviviality that exist among ‘beasts’, yet lacking among ‘human beings’ due to the caste dictated insularity (which results in precluding any possibility of sociability). In the stories, the trope of child-protagonists recurs around whom the axis of narration revolves. The author unpacks the myriad dimensions of a child’s life in delicate details. For instance, in a poignant story named ‘Durga’, the narrator gives a first person account of a child-protagonist’s turbulent life, entangled in the web of a broken family with an abusive father. But with a honed agility, the narrator veers away from subjecting her to pity and counterbalances her lot with the resilience and vivacity with which she faces the adversity. The last story in the book, ‘Wailing’, provocatively deals with the evil of female foeticide. With a measured sensitivity, the narrator exposes and disembowels the underbelly of a male-child obsessed society while underlining the dissonance in a nation’s claim (‘woman is the eye of the nation’ p. 140) and its cruel and callous treatment of the female child (as dogs carry away unwanted dead female baby). A hard-hitting social commentary, the ‘Wailing’ ought to pierce the thickets of a selectively stone-deaf society. Appropriately and evocatively named, the title of each story aphoristically announces a synoptic metaphor into what lies tucked inside. Although some of the Tamil words have been rendered untranslated with no glossary/explanations at the end, the translator and editor ought to be credited for ferrying the compilation to a wider readership. All stories are weaved with a deceptively simple narrative frame that nimbly glides and interlocks them all in a lacerating yet cumulative continuum. Purnachandra Naik is a student in the School of Languages, Jawaharlal Nehru University, New Delhi.